Persimmons were long a mystery to me. 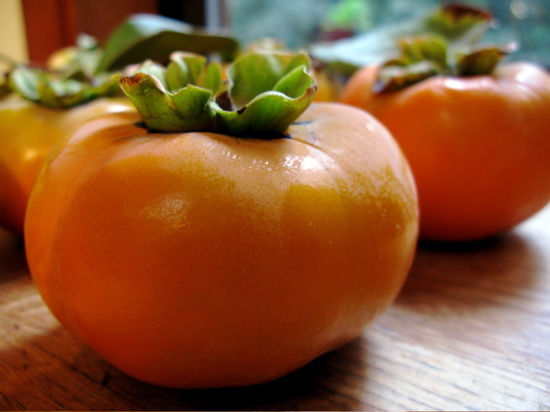 Not a food that we ate in my house growing up, persimmons never seemed quite right. When I started experimenting with new foods as a young adult, persimmons often left me feeling like I had stuffed my mouth full of cotton. Not a sensation I much enjoyed. Then I went to China. There persimmons are much more common. I learned that there are many varieties: some that are better cooked and some that are better eaten fresh. This was a total revelation! The cotton-mouth-inducing variety were indeed better cooked. The most common of these varietals in the U.S. are called hachiya. They have a distinct acorn shape. The varietals that are meant to be eaten fresh are more squat. They are crisp and refreshing when firm, with a flavor that is kind of a cross between a mango and an apricot. The most common varietal in the U.S. is called fuyu. Fuyu can also be eaten when more ripe, but when they are soft they do not hold up well in the salad. 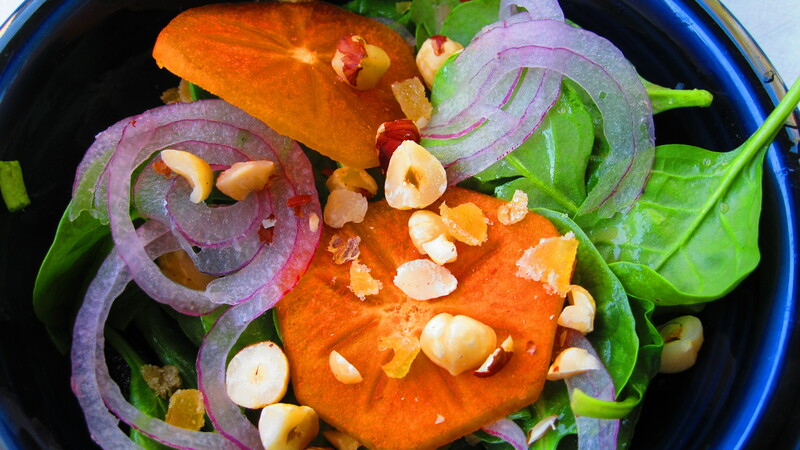 Persimmons are delicious and beautiful, and I am glad I finally figured out how to eat them! Prepare the Simple French Vinaigrette according to the recipe. Thinly slice the red onion, preferably using a mandolin slicer. Toast hazelnuts, remove their skins and chop. 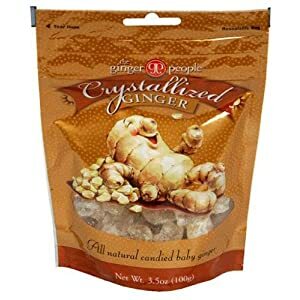 Mince crystallized ginger. Set aside 1 tablespoon and place 1 tablespoon in dressing. Stir. Prepare spinach leaves and place in a medium bowl. Toss leaves with 1/2 cup dressing (more or less to taste). Only dress the leaves when you are ready to serve the salad. Place leaves in serving bowl. Separate red onions into thin slices and scatter on top of leaves. Scatter persimmons next, followed by hazelnuts and crystalized ginger. Grind fresh black pepper to taste. Fully toss the salad at the table.